Here's how to make those leftover mashed potatoes turn into something totally different this year ... Make gnocchi! Stir together potatoes, egg and flour. Dump mixture onto floured surface and knead dough together. (You may find that you need more flour, and just add a little bit at a time). Cut the dough into three sections, then gently roll each section into a long rope. Cut each "rope" into small sizes; about half inch in size. 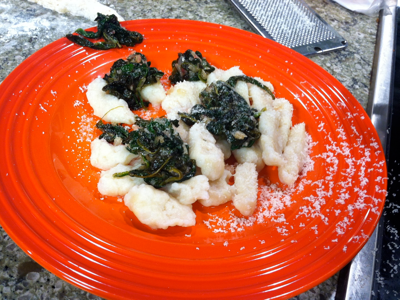 Take the tines of your fork and make tiny indentions on the top of the gnocchi. Bring a large pot of water (add about 1 Tablespoon of sea salt or kosher salt) to a boil, then drop one batch at a time (one batch being what you cut from each "rope") into the boiling water. At first, the gnocchi will sink to the bottom. When they float to the top, they are done, but let them cook for about 3 to 5 minutes. Serve with the spinach sauce or your favorite marinara sauce. In a medium sized skillet on medium heat, saute shallot and garlic in olive oil then add shrimp. Cook until all of the spinach has wilted down, then add lemon juice. Pour over gnocchi and enjoy!